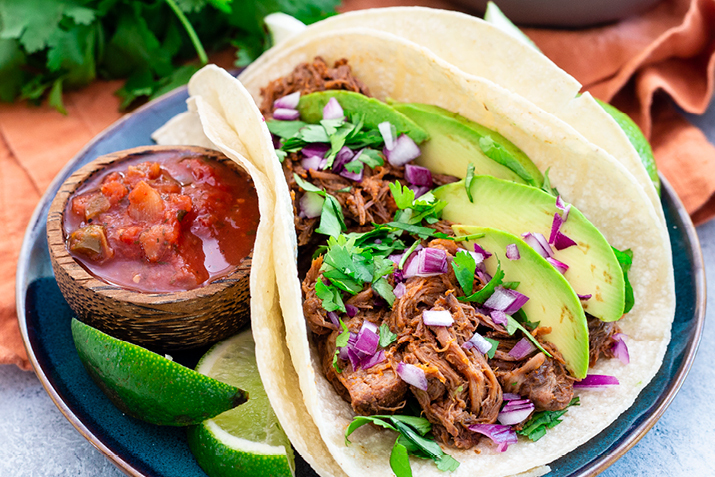 Chuck roast is cooked to tender, juicy perfection in these fabulous and easy tacos. Place the beef in a slow cooker. Stir together the tomato paste, chipotle, cumin, oregano and salt in a small bowl, then rub the mixture over the beef. Place garlic cloves and oranges on top of the meat and cover the pot. Turn temperature to high and cook for 4 hours, or on low for 7 to 8 hours. When the meat shreds when pressed with a fork, turn off the cooker and take out the insert to cool. Use tongs to transfer the meat to a bowl to cool, and shred the beef. Place a strainer over a small pot and strain the liquids from the cooker into the pot. Squeeze the oranges over the strainer. Bring the juices to a boil and cook for about 10 minutes, until reduced to a syrupy consistency. Pour over the shredded beef and toss to coat. Taste for seasoning; add salt or more chipotle, if desired. Serve with taco shells or warm corn tortillas, lettuce, chopped tomato and shredded cheese. Pair these tacos with tortilla chips and homemade guacamole or your favorite salsa. The meat can also be folded into larger tortillas with leftover cooked rice to make tasty burritos.